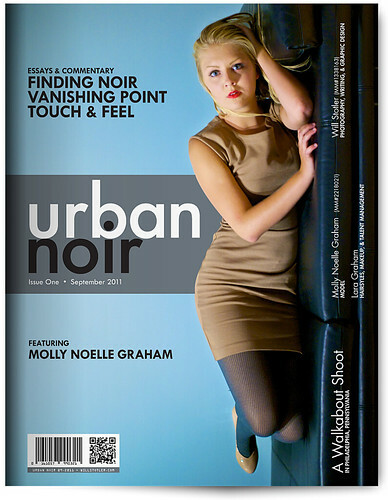 This was an experiment in developing a coherent, modern magazine design from scratch: Urban Noir magazine, Issue 1 – September 2011. 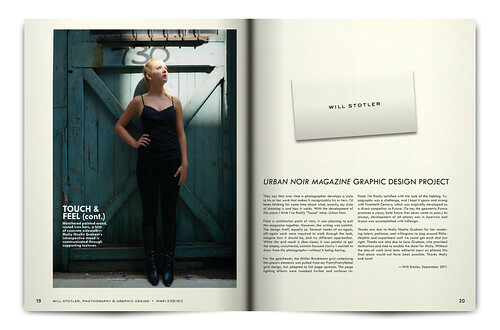 The magazine features model Molly Noelle Graham (MM#2218021). Hairstyles, makeup, and talent management were by Lara Graham. Photography, graphic design, and writing were by me. Thanks, Molly & Lara! Caption: Model Molly Noelle Graham framed in reflected light on a granite textured background, solid and foregrounded, yet casting a distorted shadow, representative of an interior space. An interplay of out-of-focus areas and selective light, plus a monochromatic color scheme, act as a counterpoint to Molly Noelle Graham’s performance, which illuminates an inner state of fragility and vulnerability. and I practice it, Urban Noir is a style that draws upon elements of both German Expressionism and American Film Noir, but plays out on the street in found conditions, mise en scène, like the best street shooting. It pulls its noir influences from both look and mindscape considerations, it’s urban because of the locale and attitude. The look must include elements of monumentalism and modernism. Exploitation of directional light, shadows, and selective focus enhance the seen and also the unseen—the feeling that just out of frame a whole world is waiting, and perhaps not this one. Within the frame, a tension between the model and his or her environment is present—the model’s position interacts with the exterior spaces to reveal an interiority, something more about the mood. From a practical standpoint, Urban Noir requires the photographer to visualize the final photographic possibilities of found spaces and light in otherwise “ordinary” street conditions. The street space must be photographed in such a way that it appears hyperreal—more real than real—or, an archetypical example of the street environment, heavily stylized through light and texture. But, the street could be anywhere in the industrialized world or nowhere at all, as on a film set. However, while the look draws from street conditions, the final photograph must draw out the interiority of the model’s performance by leveraging a sense of monumentalism and modernity from the environment. As a look, Urban Noir is characterized by a photograph visually and conceptually tied to the noir tradition, but practiced as a branch of constructed street photography. Caption: Foregrounded, Molly Noelle Graham looks knowingly as she is embedded in a photograph that makes a conceptual nod to the golden patchwork paintings of Austrian painter Gustav Klimt. Caption: The grid behind Molly Noelle Graham, coupled with an akimbo stance, short shadow, and leading, leaning lines, reveals an inner syncopation. Caption: Pools of light reflected like dappled projections onto the gridded wall illuminate Molly Noelle Graham with a sense of mystery, the image’s vanishing point hidden out of frame and out of focus, the psychology of the model exposed as quiet confidence and interior poise. in this single point. When the vanishing point is out-of-frame, often leading lines are still moving to the vanishing point, but they function in a two-dimensional fashion, flattening the image. In many 1920s German Expressionist films—and later film noir works—the sets were manufactured with a strongly forced perspective, intentionally compressed to suggest paranoia, claustrophobia, and a heightened unreality. The compressed sets with their clearly artificial leading lines—and camera angles to accentuate the compression—were a staple of the look and genre. I cannot build dramatic, forced-perspective sets in the city, but I can force the city into a dramatic perspective to frame my subject. If done correctly, the work accentuates and reveals architects’ unseen compositional grids that define the surface of the architecture—the unique fingerprint of the engineered, mathematical grid that each building possesses. Caption: The vanishing point is behind Molly Noelle Graham: a semi-opaque reflected sky, revealing an opaque vision or dream behind the model, is sublimated. Caption: Strong leading lines in the architecture—the wall and the skyscrapers—reveal and paint a grid that lead to Molly Noelle Graham, revealing a state of mind that is one half manufactured and gridded and one half featureless, smooth, waiting for the future that is unwritten—with an underlying, hidden rhythm. and the overall composition—bringing strength and monumentalism into the frame. Planes and angles are always visible to the viewer but are often taken for granted. With Urban Noir, they are made visible, present, solid, real. In film noir style, the architecture can be made deeper, larger, and looming. Or, shallow and flat, depending on the psychological feel within the envisioned photograph. Successfully shot, the vanishing point and leading lines combine during the process of making the architecture and scene dramatic in a way that evokes a companion mood to the model’s performance, exteriorizing the interior landscape. Urban Noir depends on the vanishing point—as much of noir does—to reveal a hidden urban landscape of grids and structures that wrap the model as much as his or her fashions, skin, and interior landscape. Caption: A vanishing point out of frame, a plane pulling back and away from Molly Noelle Graham, the city is absent yet present in the shadows and painted light, motion delayed. Caption: Framed in perspective, with shadows, concrete, and brick gridding the background, in full light but with the environment casting its own shadows, Molly Noelle Graham reveals a quiet waiting. In practice, textures and objects that create texture within the frame—and especially how those textures react to light—are a critical component of the street feel of Urban Noir. Without the textures of the city to anchor the look, the urban focus evaporates. A striking contrast—or striking harmony—is achieved when the model is framed against an appropriate, evocative surface, in a pool of light or, if the light is flat, with the surface’s texture or color. The urban is necessarily defined by its textures: manufactured surfaces including steel, aluminum, iron, brass, stucco, concrete, cinder block, asphalt, travertine, marble, tile, glass, brick, and wood. These are punctuated by water and sky. Additionally, the level of decay, weathering, and moisture of any surface grants it a character, from grimy to pristine. Caption: A rusted, double chain-link fence pulls Molly Noelle Graham forward, supported by the grit and hardness of asphalt, mirroring a hardness of character. Caption: Shored up by rough cinder blocks and supported by cracked, stony concrete, Molly Noelle Graham’s silent defiance is framed. Caption: Symmetrical cinder block patterns and weathered, asymmetrical wood planting boxes punctuating the rough, grey surface, reveal the stolid beauty of Molly Noelle Graham’s muted performance. Not all surfaces are created equal—some can be leveraged to imbue the image with an appropriate Urban Noir feel, others not. A staple of film noir is the use of large areas of shadow, concealing details while revealing others for a combined melodramatic and psychological impact. Textures are secondary in film noir, yet vital, as they catch or reflect the light to add depth or suggest a mood. Urban Noir reveals the model’s inner psychology partly through texture—glass and concrete for a hard, cold edge, asphalt and wood for a more organic, natural feel—yet still urban. As a final point about the touch and feel of an Urban Noir photograph it is worth saying that in the absence of black and white film grain, the muted colors of the city, projected through their textures, surround and add to the model’s inner world as revealed in the image. Caption: Thoughtful and posed before brilliantly reflective aluminum, strikingly positioned on stained white-painted concrete, or framed on golden stucco, Molly Noelle Graham’s inner states of mind are exposed through the touch and feel of her environment—from reflective to absorptive. Caption: Weathered painted wood, rusted iron bars, a hint of concrete sidewalk—Molly Noelle Graham’s introspective mood is communicated through supporting textures. They say that over time a photographer develops a style to his or her work that makes it recognizably his or hers. I’d been thinking for some time about what, exactly, my style of shooting is and how it works. With the development of this piece I think I’ve finally “found” mine: Urban Noir. From a satisfaction point of view, it was pleasing to pull this magazine together. However, the writing was painful. The design itself, equally so. Several weeks of on-again, off-again work were required to work through the look, imagine how it should be, and try different approaches. While the end result is über-clean, it was painful to get the simple, uncluttered, content-focused clarity I wanted to draw from the photographs—without it being boring. For the gearheads, the Müller-Brockmann grid underlying this piece’s elements was pulled from my PrettyPrettyRebel grid design, but adapted to full page spreads. The page lighting effects were tweaked further and surfaces refined. I’m finally satisfied with the look of the lighting. Typography was a challenge, and I kept it spare and strong with Twentieth Century, which was originally developed as a direct competitor to Futura. (To me, the geometric Futura promises a clean, bold future that never came to pass.) As always, development of all photos was in Aperture and layout was accomplished with InDesign. Thanks are due to Molly Noelle Graham for her modeling talent, patience, and willingness to slog around Philadelphia and experiment until we could get each shot just right. Thanks are also due to Lara Graham, who provided dedication and time to enable the shoot for Molly. Without the day-of work (and later editorial input on photos) this final piece would not have been possible. Thanks Molly and Lara! 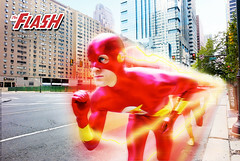 This entry was posted on October 3, 2011 by willstotler. It was filed under Commentary, Design, Photography . - For scheduling, shooting information, & more.